Facebook Post Screenshot is a free Firefox addon to save any Facebook post with all comments, replies. 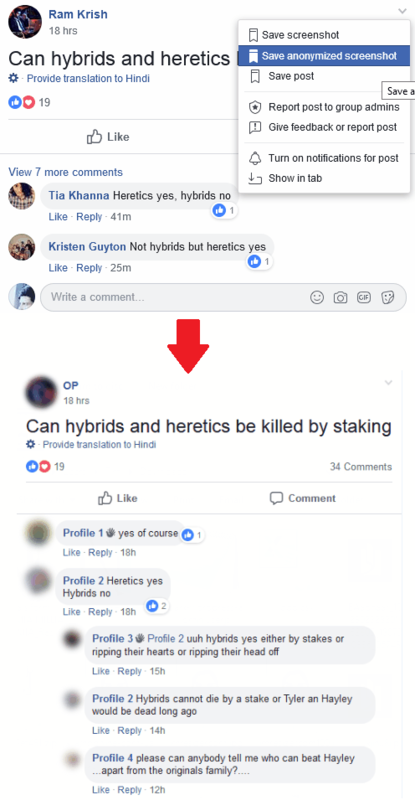 This addon adds an option in the dropdown menu that each Facebook post has to save it as an image. In just one click, you can save any Facebook post as a PNG file with all the comments and the replies. Also not only this, but this with this addon, you can save the Facebook post in anonymous mode. In anonymous mode, it hides names of all the people in comments and blurs out their profile pictures. This is a useful plugin for a lot of people to instantly save a Facebook post anytime they want. However, this add-on is currently available for Firefox only. If you go and try to screenshot a Facebook post manually then you will first have to expand all the comments, replies, and use some screenshot software which can take a screenshot of scrolling page. But with this addon, you don’t have to do that. Just install this Firefox plugin and it will let you do the same to save any Facebook post as an image. As I have mentioned, there are two different modes to take a screenshot so you can choose anyone and save any post you like on your PC. This is a helpful tool if you often do research on Facebook posts and want to include them in your research report. 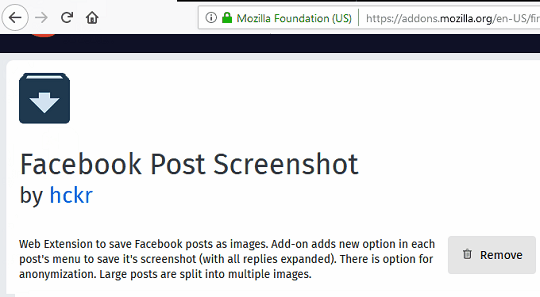 Facebook Post Screenshot is an open source Firefox extension that you can use. You can either install it from its source code for you can directly install it from Mozilla addons store. After installing you don’t have to do anything, just open Facebook and navigate to the post whose screenshot you want to take. Now, you don’t have to expand the comments or replies as it will take care of them itself. Click on the dropdown menu at the corner of the Facebook post and select “Save Screenshot” option. As you do that, a small popup will open at the top side and after a few seconds the screenshot will automatically start downloading. 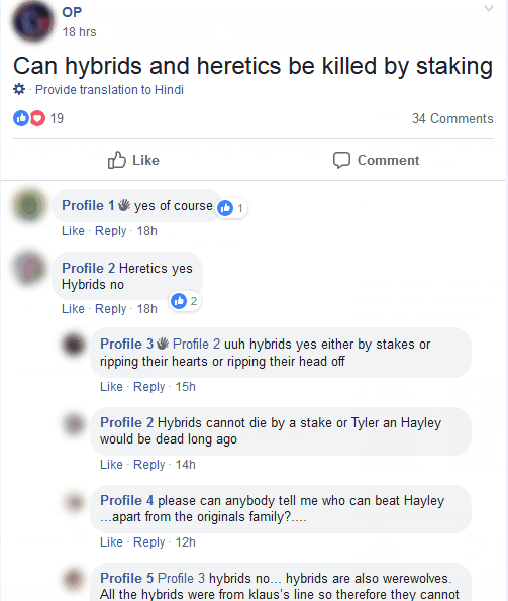 The amount of time it takes to capture the screenshot depends on the number of comments on that post. In the similar fashion, you can save the screenshot in anonymous mode. For that, you just have to select the “Save anonymized screenshot” option. It does the same thing in this mode except it hides usernames and their profile pictures. This is helpful option if you want to post that screenshot to some public websites where you don’t want to expose any user’s identity. In this way, you can you this simple and useful Firefox addon to take Facebook post screenshot. It works with almost all type of posts no matter whether they are on a page, group or on any user’s timeline. Just one click is all needed to save screenshot of a post on your PC. There are various tools to take screenshot of a tweet to save it as an image, but if you want to do the same for Facebook then use the tool I have mentioned here. With this, you can quickly take a screenshot of any FB post and save that. Also, the anonymous mode in this tool is what I liked most. If you want to save a meme or other FB post with comments then you can do that in a click. So, if you need a screenshoter for Facebook, use the addon explained in this post and let me know what you think about it.